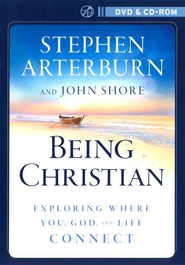 What does being a Christian in this postmodern age really mean? Addressing new believers and seasoned saints alike, this easy-to-use 7-session study examines Christianity's core beliefs and practices. Find answers to questions concerning God's love, forgiveness, bad habits, Bible study, and more. Kit includes: 7 session DVD with each session 5-9 minutes in length with teaching by Stephen Arterburn, and CD-ROM with printable leader's guide, poster, and bulletin insert.